This article first appeared in City & Country, The Edge Malaysia Weekly, on September 10, 2018 - September 16, 2018. Bukit Ceylon, a mature residential neighbourhood in the Golden Triangle of Kuala Lumpur, is known for its bungalows with sprawling grounds, high-rise developments and boutique restaurants that hum with life in the evenings. Bordered by Bukit Bintang and Raja Chulan, Bukit Ceylon is noted for its accessibility to offices, banks, restaurants and shopping malls. The Weld in Jalan Raja Chulan is one of the more recognisable commercial developments in the area. A supermarket in the 1960s, The Weld has had a facelift and been transformed into a food and beverage hub for residents in Bukit Ceylon. Another of the area’s iconic landmarks is Old Malaya in Jalan Raja Chulan. Built in 1919, the building still has its colonial façade but it now hosts trendy restaurants and bars with unobstructed views of KL Tower and the city. Lanson Place Bukit Ceylon Serviced Residences and the St. Andrew’s Presbyterian Church, which was built in 1918, are other noteworthy buildings. Flanked by the hot spots and amenities of Bukit Bintang and Raja Chulan, Bukit Ceylon is evidently strategically located. Nearby amenities include the Tung Shin Hospital and SJK (C) Nan Kai. Some of the completed residential projects in the area are Vida Bukit Ceylon by Spritzer Resources Sdn Bhd, Suasana Bukit Ceylon by Exquisite Skyline Sdn Bhd, a subsidiary of United Malayan Land Bhd and Laman Ceylon by Eminent Ace Sdn Bhd. “There aren’t many landed properties in the area but mostly colonial bungalows that have been converted to restaurants or demolished to make way for high-rise residential developments,” opines Toh. KGV International Property Consultants director Anthony Chua concurs. “Like many other old residential areas in the city centre, Bukit Ceylon, consisting predominantly of bungalows, has evolved over the years into a high-density residential enclave consisting of condominiums, hotels and offices,” he says. As land is scarce in Bukit Ceylon, the demand for high-rises is stronger there. “Non-landed properties are highly sought after in the area because of its close proximity to the commercial and shopping district in Kuala Lumpur,” says Toh. Chua concurs. “Demand for non-landed properties is observed to be high in the area as it is near both KLCC and the Bukit Bintang shopping district. The old bungalows there are potential sites for high-rise developments,” he says. The prices of the condominiums in Bukit Ceylon range from RM500 psf to RM800 psf while those in the newer schemes can go up to RM1,500 psf. Average rental rates for these properties are between RM2.30 psf and RM4.50 psf, which means yields are between 3% and 5%, according to Chua. “The bungalows [excluding the older ones] command RM1,000 psf onwards,” says Chua. According to Toh, the demand for commercial properties in Bukit Ceylon is relatively high. “This is due to the close proximity to Bukit Bintang, especially Changkat Bukit Bintang, a well-known nightlife district in KL. “Tourists flock to the area and as a result, the non-landed properties have some commercial value in terms of operating the condos and serviced apartments as Airbnb units. 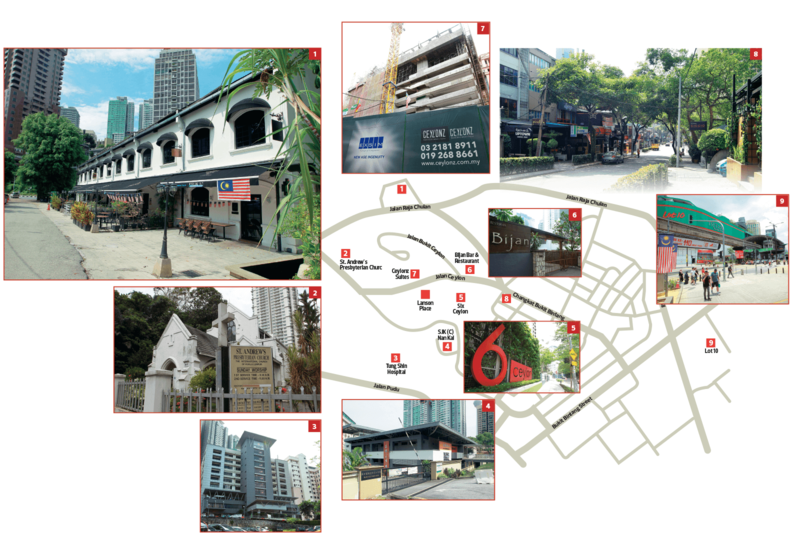 Chua points out that the area’s commercial shops are mostly in Changkat Bukit Bintang. These are former homes that have been renovated into trendy outlets that cater for tourists, he adds. An upcoming high-rise development in Bukit Ceylon is Ceylonz Suites @ Bukit Ceylon by Exsim Group. Due to be completed in 2020, Ceylonz Suites is a 39-storey studio-office tower with a gross development value (GDV) of RM352 million. It offers units with built-ups of 384 sq ft to 411 sq ft while its dual-key units are 578 sq ft in size. Launched in 2016, the units are priced from RM619,760. Also upcoming is Pavilion Ceylon Hill by Pavilion Group. Located in Changkat Raja Chulan, the freehold development comprises over 600 serviced apartments housed in a 51-storey tower and a bungalow. “Due to be completed in 2021, the units have built-ups of 540 sq ft to 1,374 sq ft and prices of RM972,000 to RM2.7 million,” says Toh. Meanwhile, Chua sees bright prospects for Bukit Ceylon. “Its proximity to the Bukit Bintang shopping district and other tourist attractions, such as Bukit Nenas and the KL Tower, plus an abundance of offices around, provides various development options and investment opportunities,” he says. Toh agrees. “Property prices there will continue to rise, albeit at a slower pace due to the number of new and existing high-rises in the area,” he opines.